2007 800 XRS Summit 159 3101 Miles 2.5 in Paddle Track, no lugs missing but some are getting rough. 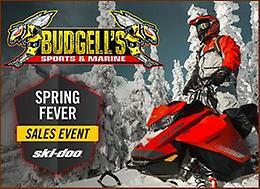 7 in Sly Dog Skis Gas Caddy Attachment Electric Start Reverse Hand Warmers Selling as is where is. Text 709 277 7583 for fastest response. Selling a 2011 XRS 800etec. Sled is in great shape, 7000km on the machine. Always stored inside since new, no rust. Good track, carbides etc. New protaper bars and clamps, RS snow flap. $6000 obo. Call or text 7095337139 for fastest response. Less than 800 original kms 1.75" track SnoStuff Can 8' Riser Handgaurds Hand & Thumb Warmers Tunnel Braces Spare Belts Tek Vest 1 owner reason for selling is lack of use. Willing to trade for something of interest. Machine has 6000km but motor recall was done at 2000km, only 4000km on her. Brand new reed pedals, intake boots, plugs, belt, suspension bearings, slides and clutch buttons this winter! Has GGB Mountain can. Track is ok but could be replaced. Other then that, she’s mint. Stickers have been removed due to broken side panel and were no longer available to buy when panel was replaced. Text or call anytime.